Cloves or Laung are the immature unopened flower buds of a tropical tree. Their flavour can be termed as sweetly pungent, astringent and strongly aromatic. Moreover, this ancient culinary spice is used in cuisines all over the world. Apart from food, it is used for flavoring some wines and alcoholic beverages as well. Cloves(Laung, Lavang) are an excellent source of vitamins and minerals. Buy(order) Clove-Laung online at whole sale price from KiranaPlace, a online spice and seasoning store. Cloves or Laung are the aromatic flower buds of a tree in the family Myrtaceae, Syzygium aromaticum. The clove tree is an evergreen that grows up to 8–12 m tall. When fresh, they are pink, and when dried, they turn to a rust-brown colour. Cloves may be used to give aromatic and flavor qualities to hot beverages, often combined with other ingredients such as lemon and sugar. Its flavour is due to the presence of a compound called Eugenol, which has a very strong aroma. It is also prominently used in Cigarettes to add flavour. Apart from the seasoning benefits, Cloves also has traditional medicinal uses in Indian Ayurvedic medicine and Chinese medicine. Cloves(Laung, Lavang) are an excellent source of magnesium, phosphorous, potassium, calcium, iron, zinc and sodium, vitamins found in cloves include vitamin A, vitamin C, vitamin D, vitamin E, vitamin B6, vitamin B12, thiamin, riboflavin, niacin and folate. Cloves provide relief from toothache. Consuming cloves can be helpful in curing cough and bad breath problem. Clove is good antibacterial mouthwash, when boiled with water and gargled. 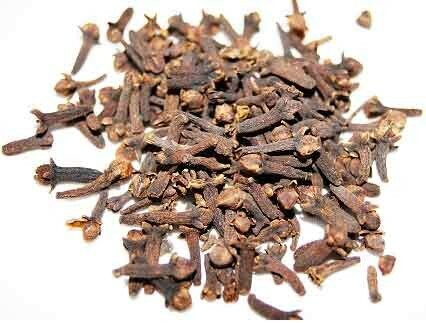 Cloves is good remedy for treating morning sickness. Cloves or clove oil can be used to prevent hair loss. Clove is valuable herb, beneficial in reducing blood sugar levels. Clove also include relieving headache.